What to expect at Deviniti Jira Day? While Deviniti describes its Jira Day as “the largest in Poland”, we claim that the thing is one of the largest Atlassian Expert events in the world. Who else gathers the Jira crowd at a stadium? But the event is certainly different in other ways, too. Since it takes place in Poland, is it an English-speaking event? Is it worth traveling to for people from Western Europe, the U.S. and other parts of the world? If yes, how to prepare? In 2018, during the 6th edition of InTENSO Jira Day, InTENSO announced that they were changing their name. So, the 2013-2017 editions were officially named InTENSO Jira Days, but starting 2018 it was actually Deviniti Jira Day. There was a lot of “Deviniti formerly InTENSO” buzz everywhere in the materials. Why they changed their name? By their own admission Deviniti = Development + Infinity, and their old name, InTenso IT Experts, is no longer consistent with their vision. Consider this: the 2018 Deviniti Jira Day was so tightly packed with lectures from experienced Jira users (Capgemini, MetLife, Allegro and mBank among others), food (!) and Jira partners booths, that we were almost saying it was an overkill. It’s probably because a “Jira revolution” is occurring in Poland, and there is close to zero professionally organized Jira conferences. InTENSO / Deviniti was extremely professional not only for project managers and IT administrators, but also for the Atlassian partners, like us. They even invited the partners to the dinner, on the eve of the Days. Is the event for me if I’m not a Jira user (yet)? Yes, only browse through the list of lectures below to realize Deviniti Jira Day is for newbies, too. Is the event international, =English-spoken? Take a look at the presentations’ titles below. Even though some 50% are in English, there is enough to do for a non-Polish individual at the event. And we think Deviniti Jira Day 2019, Deviniti Jira Day 2020 and so on, will be even more English biased. So, what exactly to expect? Will be held in Warsaw, Poland on 29-30.05.2019. 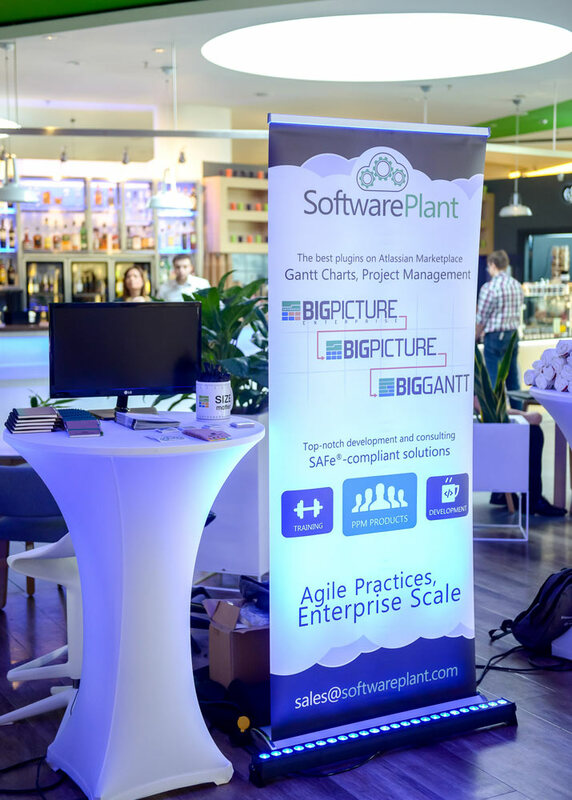 SoftwarePlant + BigPicture will be present! As we attended both the ‘2017 and ‘2018 editions we claim responsibly the Deviniti Jira Day is growing in size. We had a full auditorium during our “SAFe® plus BigPicture” presentation and constant traffic at our stand. There was a constant traffic at our stand at Deviniti Jira Day 2018. Genevieve Blanch, RefinedWiki: Customizing Confluence and Jira sites. Gergely Gumaig, Meta-Inf: Share consciously and carefully in Confluence. Who can view your pages? Great location (stadium), free 700-bay parking. 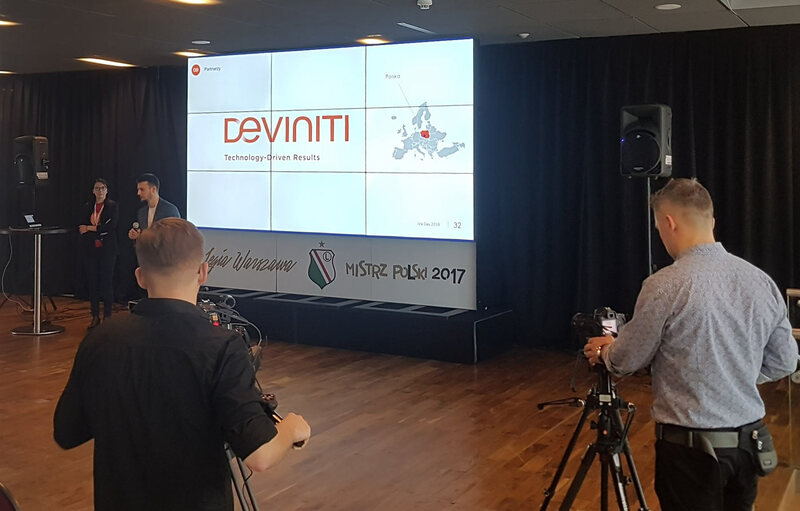 Even though Deviniti is based in Wroclaw, 4th Polish city in terms of population, they made an effort to bring the event to the capital. Thumbs up. Brilliantly located vendors area – in the main thoroughfare and close to catering. Considerably more participants than in 2017 – at least 300. 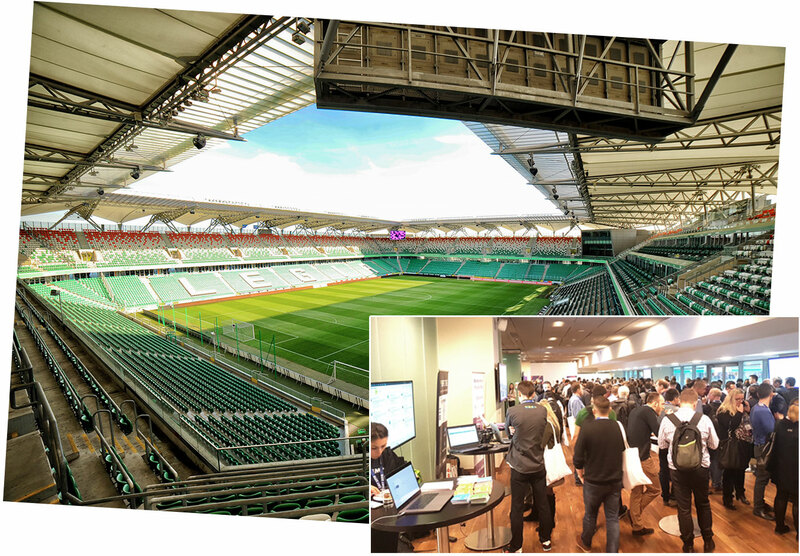 One of the biggest partner events in Europe and we attended quite a number of them. Each vendor was allowed 2 minutes at the very beginning to introduce themselves to the guests. This by far helped us gain attention and sell our project management apps at our booth later. 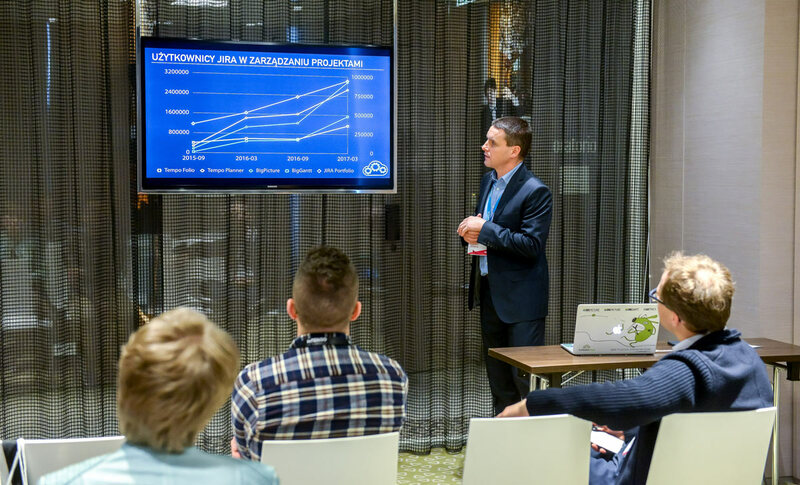 Our SAFe®– and BigPicture-related presentation filled a full conference room, just imagine close to no chairs vacant ;) And we had booked a large room. A vendor&partner integration dinner on the eve of Deviniti Jira Day. Day 2 was scattered on two floors and this adversely affected the networking. People were busy moving between far-away auditoriums. 14th March 2018, 10 a.m. InTenso announces that they have just transformed into Deviniti. InTenso allows up-to-1-meter-wide rollups for their Jira Day and this hasn’t changed with their transformation to Deviniti. 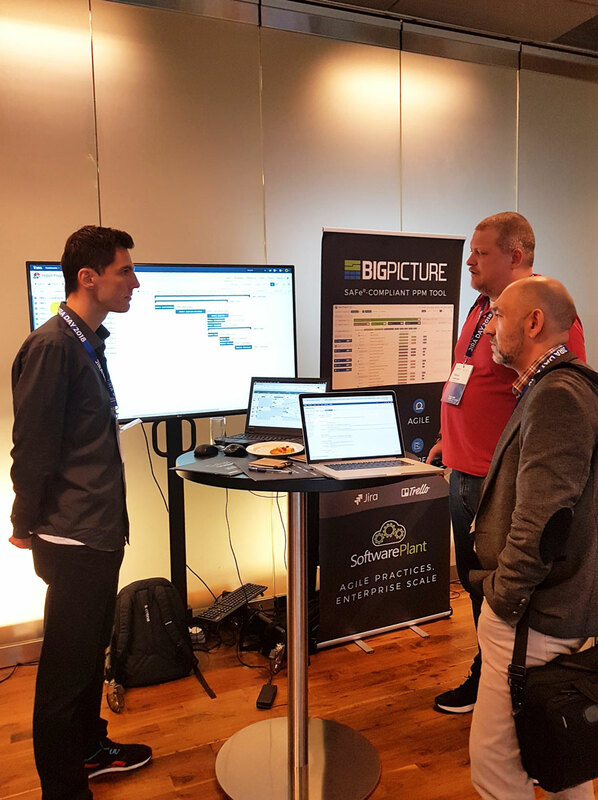 Our booth at InTENSO Jira Day 2017. Just a few photos from the 2017 edition, so you can realize how the event has changed. InTENSO Jira Day used to be somewhat more elite and formal before, and, yes – focused on Polish users. But it certainly underwent transformation and is now more democratic and more English-spoken with the inflow of foreign guests. Tom Kucharski of SoftwarePlant shows the increase of world Jira “population”. InTENSO Jira Day 2017.